This past Saturday night in Mexico City's colonia Roma Norte, the arrogant daughter of the Mexican capitol's consumer protection agency, or PROFECO, Andrea Benitez Gonzalez, drew a maelstrom of international condemnation on twitter for closing the popular Maximo Bistrot because she didn't like the table they offered her during a busy time at the restaurant. When Andy--her nickname--showed up to a packed house at Maximo Bistrot without a reservation and had to wait for a table, the privileged brat of Humberto Benitez Treviño became increasingly agitated. Restaurant staff offered her a table inside as soon as some seats opened up, but she demanded a table on the patio; when they couldn't accommodate her, she threatened to get her dad's office to come pay them a visit. Everything was captured on twitter from her complaints to a Foursquare check-in at her daddy's office, where she enlisted officials to come down and close Maximo. The elite of Mexico have always behaved this way but it has been their word against the rest of the population--not this time--thank you twitter. The brilliant Daniel Hernandez of the L.A Times, and equally professional Damian Cave of the New York Times--both Mexico City based--each covered the story today in their respective papers. While these two chingones got their facts in order and captured the big picture something has been missing in this equation, and that's the importance of Chef Eduardo Garcia, a shooting star in Mexico's fine dining scene. Garcia worked under Chef Enrique Olvera at the 17th best restaurant in the world, Pujol, according to Pellegrino's prestigious ranking, and did some time at Eric Ripert's Le Bernardin, number 19 on the same list. Hernandez referred to Maximo as a "local fare" "corner cafe"--Cave more accurately likened it to a "Chez Panisse of Mexico City", and a "gastro-paradise", but Garcia is a bit more than that, and he's the reason customers are fighting mad. Garcia has caught the attention of the best chefs in Mexico--especially the younger generation--for opening the first no-nonsense, no-frills restaurant dedicated to the best local ingredients and the highest standards. In recent years, some attention has shifted from Polanco to the new restaurants in Condesa like MeroToro, and in Roma, but Maximo is in Roma norte, where the rent is cheaper. He's attracted a broader range of younger diners in D.F. that are more interested in the food than the scene, which is not always the case in the exclusive restaurants that dot the glamorous avenues of Masaryk and Horacio. 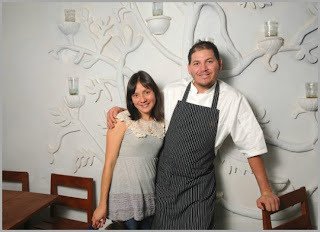 I attended a diner back in November of 2012 at Maximo Bistrot during the Corredor Cultural Roma Condesa featuring Garcia and Chef Pablo Salas of Amaranta in Toluca. It was a memorable meal and it was refreshing to see the two young chefs having such a great time doing what they love for an audience that truly respects the craft of cooking. 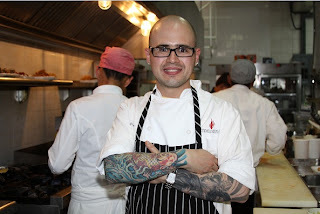 "I love what the chef is doing here because it's all about the food", said an enthusiastic Salas. On Saturday night when the corrupt PROFECO henchmen showed up they were met with hostility from fans of Maximo--something that may not have happened somewhere else--usually, rotten kids like Andy would have gotten away unscathed, but patrons started taking pictures of the PROFECO officials, and even got physical with them. 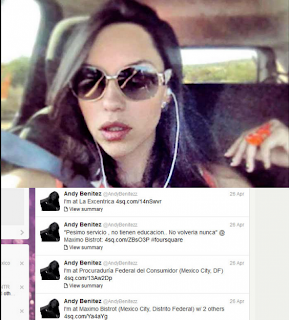 The pictures and tweets turned into tens of thousands of angry, vulgar tweets towards Andy and her soon to be investigated father, as the PROFECO shut Maximo Bistrot down for reservation irregularities, and for serving mezcal that wasn't from the espadin agave, which apparently is illegal in Mexico City. The officials had retreated to their vehicle to wait for reinforcement. These weren't the typical Polanco diners, these were, for lack of a better term: foodies. As I post here the twitter account of Andrea Benitez Gonzalez continues to take a beating and this has legs to go beyond every media outlet in Mexico, and the two big players in the U.S., to become a global scandal. For one shining, inspiring night, twitter became a force to fight corruption in Mexico, a country that has been longing for their elected officials to end this systemic abuse from police, politicians, and the favored heirs that dampen the spirits of working Chilangos like Lady Profeco(nickname dubbed in twitter), and her poor excuse for a father. Every day, poor Chilangos line up at the various comedores comunitarios, or community kitchens set up by the local Ayuntamiento (government aid centers) for subsidized 3-course meals for $10MXP--the poor wait in oppressive lines all day long. Andy's father should lose his job, and as for Lady PROFECO, my wish is that she spend some time serving food at the comedores, and having her lunch there as well to have a moment to think about her gross abuses of power. It's time for a change in Mexico, and if the elite can't give up their advantage, then maybe social media will be how small acts of justice are upheld. Bravo to Maximo Bistrot and its devotees--stop in for a meal and a show of support next time you're in D.F. Great post -- thanks for highlighting the important young chefs as well as the miscreant politican daughter! For the record, the PROFECO inspector thugs were INCORRECT regarding the kind of Mezcal being sold at Maximo Bistrot. The law governing the Mezcal designation (similar to that for tequila) does, in fact, allow for a variety of agaves. In their hurry to find any excuse to close the restaurant, they got their facts 180 degrees wrong.